Morton’s neuroma is a painful condition that affects the ball of your foot, most commonly the area between your third and fourth toes. Morton’s neuroma may feel as if you are standing on a pebble in your shoe or on a fold in your sock. Morton’s neuroma involves a thickening of the tissue around one of the nerves leading to your toes. This can cause a sharp, burning pain in the ball of your foot. Your toes also may sting, burn or feel numb. High-heeled shoes have been linked to the development of Morton’s neuroma. Many people experience relief by switching to lower heeled shoes with wider toe boxes. Sometimes corticosteroid injections or surgery may be necessary. Unfortunately, the cause of Morton?s Neuroma remains unknown to researchers. It is likely that a variety of factors may play a role in the development of this condition, including the presence of chronic pain conditions like fibromyalgia. Factors that may contribute to the development of Morton?s Neuroma include Wearing improperly fitting shoes can cause pressure on your foot, leading to swelling around the toe nerves. High heels are of particular concern as they cause a large amount of weight to be shifted to the ball of the foot. Repetitive activities like jogging, walking, and aerobics can also place a lot of pressure on the feet. This could lead to Morton?s Neuroma. Having a previous foot or muscle injury may cause you to hold your foot in a poor position when walking, contributing to nerve inflammation. Some people are just born with poorly shaped feet. People with extremely low arches or “flat feet” may suffer from Morton?s Neuroma more than others. Hammer, mallet, and claw toes have distinctive differences that can assist you in determining what kind of toe problem you are dealing with. All three conditions deal with toes that are curved into abnormal positions, which possibly look strange and may cause pain. Typically, the big toe is not affected by these problems. A hammertoe tends to bend downward at the center of a toe joint. It generally affects your second toe. 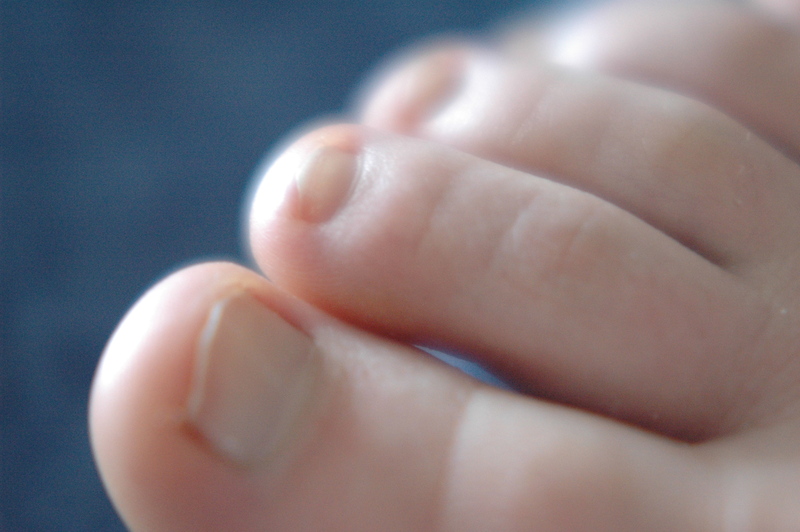 The affliction causes the center of your toe to rise and is often accompanied with a bony lump. While there are a number of causes, there aren’t many specific risk factors for hammertoes, women tend to get these problems more than men, but they occur without rhyme or reason. Diabetics, however, are more likely to get a hammertoe if they have underlying nerve damage in the toes and feet. Your doctor may prescribe some toe exercises that you can do at home to stretch and strengthen the muscles. For example, you can gently stretch the toes manually. You can use your toes to pick things up off the floor. While you watch television or read, you can put a towel flat under your feet and use your toes to crumple it. Finally, your doctor may Hammer toes recommend that you use commercially available straps, cushions or nonmedicated corn pads to relieve symptoms. If you have diabetes, poor circulation or a lack of feeling in your feet, talk to your doctor before attempting any self-treatment. A fallen arch or flatfoot is known medically as pes planus. The foot loses the gently curving arch on the inner side of the sole, just in front of the heel. If this arch is flattened only when standing and returns when the foot is lifted off the ground, the condition is called flexible pes planus or flexible flatfoot. If the arch disappears in both foot positions, standing and elevated, the condition is called rigid pes planus or rigid flatfoot. Flat feet can exhibit a variety of symptoms, from mild to severe. The extent of the flat foto does not always correlate with the extent of symptoms. Patients may complain of arch pain and heel pain. Commonly there is pain on the outside of the foot, where the foot meets the ankle as the collapse foot abuts against the ankle. Muscle cramps within the foot, and onto the leg (shin splints) may occur. In general, patients have pain with activity, such as walking or running. The pain may be deep and focal to a generalized widespread achy feeling. Irritation from shoe gear can cause redness and swelling. Common reasons patients seek treatment are pain, interference with walking or activities, difficulty fitting shoes, swelling, and notice a change in appearance of the foot and/or unsightly appearance. To stop foot pain it is advisable to wear shoes that are well cushioned and have a flexible area at the ball of the foot. For severe conditions doctors and podiatrists may recommend orthotics or orthoses. These are insoles which are specifically modelled from plaster cast of the patient’s foot. Orthopaedic footwear is also good in treating foot pain. For correct treatment of widespread orthopedic issues within the foot it is required to make use of orthopedic sneakers regularly. The feminine part of the sufferers are more likely to immediately hurry to buy only essentially the most beautiful models of orthopedic sneakers for women Nonetheless, do consult your orthopaedist prior to purchase, as he will recommend probably the most suitable footwear needed to your specific feet situation. Bunions can also be a result of arthritis, which often affects the big toe joint. There are numerous ways to treat flat feet.